I particularly love this post, as Liz is a good friend of mine. She and Charlie got married in October 2011. 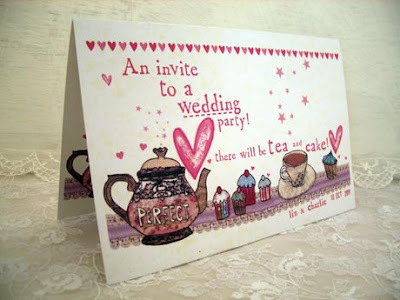 From Alice Palace greeting card company, Liz works with her sister, designer Alice Boston - together they are the Alice Palace team. Lovely gals and both good friends of mine for years. "The proposal: Charlie bought the engagement ring from Andrew Scott Jewelers in Cheltenham and kept it as a secret from friends and family. 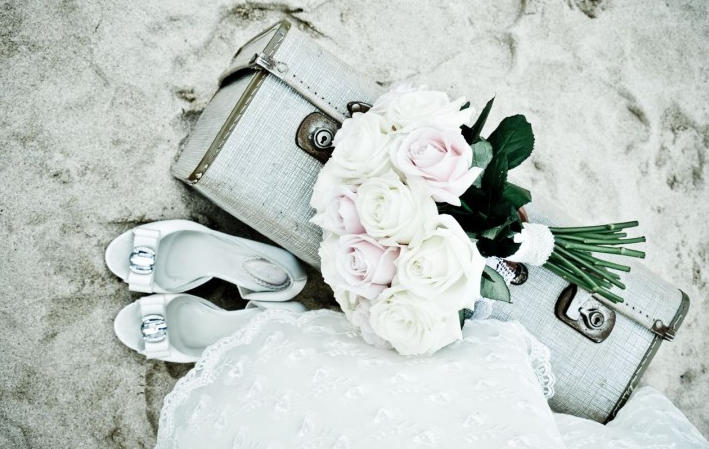 It was a surprise proposal on holiday in Spain in April 2008. The vision for the day: a fun and relaxed feel with our closest friends and family, and a vintage twist. The planning process: having moved house and also having spent a long time saving for the wedding, we finally set the date in April 2011 to be married in October. 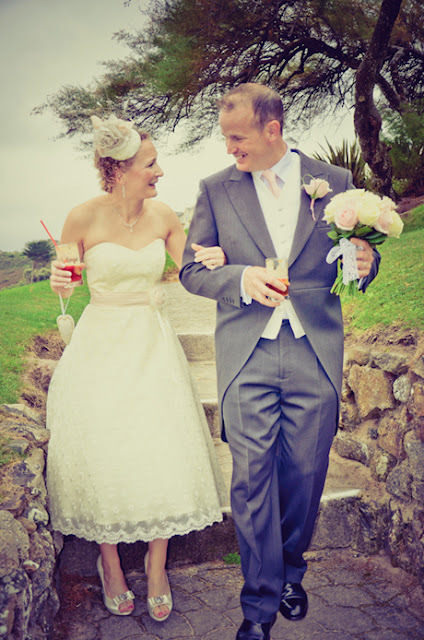 We regularly travel to St Ives in Cornwall in our VW Camper and so we decided to get married in St Ives because we love it so much and because it’s so beautiful there. 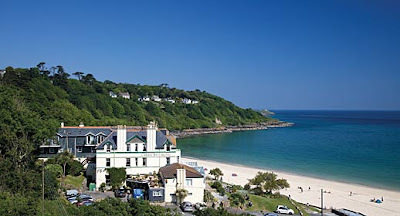 As soon as we saw the Carbis Bay Hotel (which is right on the beach) we knew it was the place in which we wanted to get married. 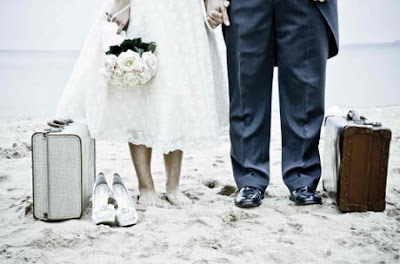 Listening to the waves crashing on the beach and the idea of having our photos on the beach made it even more perfect. We only visited the hotel three times between April and the wedding itself. The rest of the planning was done via the telephone and by email. Victoria Williams the wedding co-ordinator at the hotel was absolutely fantastic. She was very happy to go with our ideas and suggestions for the day and nothing was too much trouble. This meant we had the day exactly as we wanted it. We were on a pretty tight budget, so for our décor etc. we made purchases on ebay and our table centres were old vintage books and tea cups which we purchased from charity shops. We made our own table confetti and hand-stamped all the place names. The dress and accessories: I already had an idea of the style of dress I was after, but finding it was proving to be a little difficult! I actually designed the dress myself with the help of my dress-maker, Alison, and I chose all the material too which was amazing! The dress was then handmade from scratch by Alison Anthony of Alison Anthony designs Cheltenham (01242 251 887). The process was incredibly enjoyable and I only had 3 fittings! Alison is very experienced and once I told her what it was I wanted, she made just that! I had a '50s style dress which completely suited our wedding style! 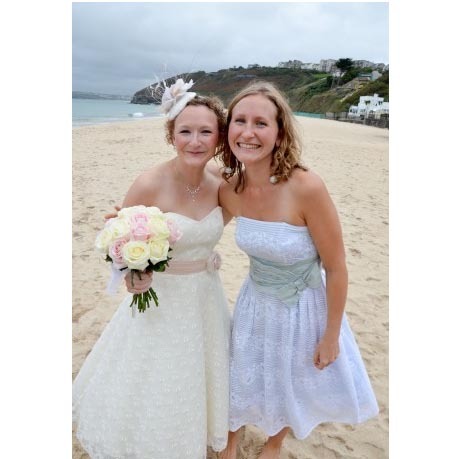 My jewelery was something borrowed from my sister Alice, a necklace and earrings which she wore to her own wedding. My shoes were ivory ‘pink paradox’ shoes which I purchased second hand from ebay. I got my hair fascinator in the sales and then Alison added some of the spare material from my dress to make it match. I did my own hair and make up. 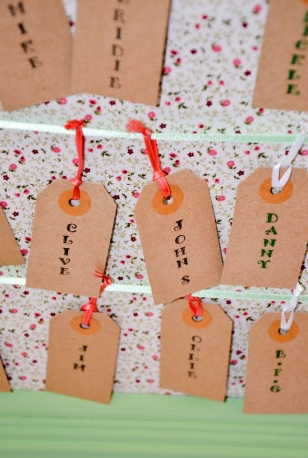 Groom’s attire: Slaters hire – we had a green and pink theme and invited our guests to join in and wear something pink or green if they so wished. 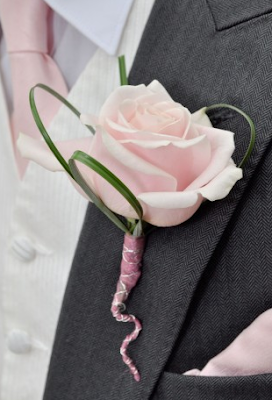 Charlie wore a pink tie to go with the pink banding around the middle of my dress. The readings and music: Readings: a 'Lovely Love Story' read by my best friend and her husband. The music was chosen by Charlie and I. We played it from an ipod. The flowers: Lizzie Newbury from Wheal Sara flowers St Ives. 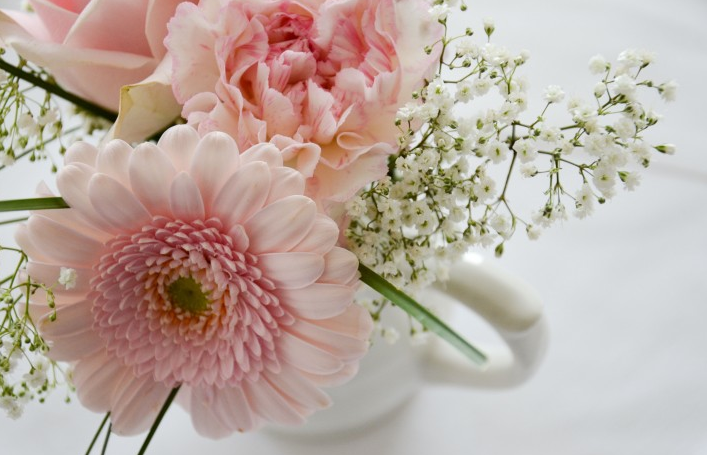 We had very simple flowers for our table centres consisting of gerberas roses and carnations, and the bridal bouquet was a beautiful bouquet of roses tied with lace. The cake: We got a three tiered sponge wedding cake from Marks and Spencer and added ribbon and edible buttons in pink and green purchased on Etsy. 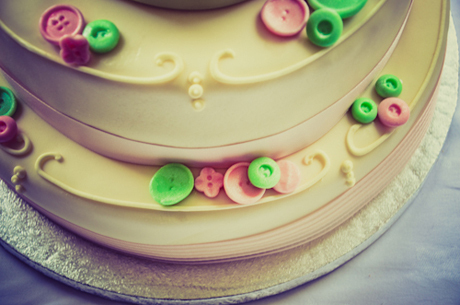 We also had some cupcakes with the most amazing icing which we displayed on vintage tiered cake stands from the local bakery in St Ives: St Ives Bakery (01736 798 888). The photographer: Elly Mac Photograpy. We spotted an article in one of the wedding magazines which featured some of Elly’s work and we loved the look – romantic, vintagey and fun – which is exactly what we were looking for. On the day Elly was amazing – she put up with our famliy shot requests! And also bought along some brilliant props for us to have in the photos. Elly is very friendly and we both felt completely at ease with her. It was really realxed and she made it really good fun. The details and décor: Charlie and I are real foodies and we both decided we would each choose the food for the main wedding breakfast and for the evening food. 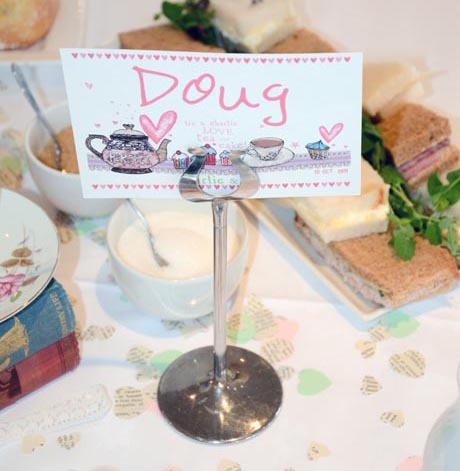 I chose a cream tea with traditional jam and clotted cream and finger sandwiches which we had served as the wedding breakfast. Charlie chose hotdogs and chips with salads for the evening food. (Both the potatoes and pork were from local sources in Cornwall). We had a simple ceremony in the hotel conservatory which overlooks the beach and we were lucky enough that it was a lovely day so were able to have the doors open so we could hear the waves crashing as we said our vows. 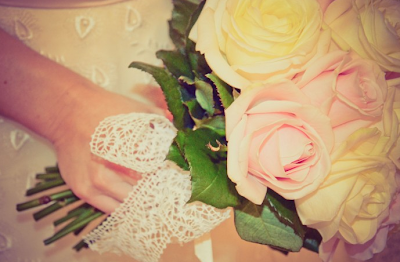 I was given away by my elder sister Alice, and I walked down the aisle to ‘Marry Me’ by Train. We walked out as the new Mr and Mrs to Elton John's 'Your Song'. We had an old type writer as our guest book, and we created a photobooth with props which was great fun and which our guests loved! For the décor we purchased some lovely prints from Folksy and then framed them in old frames we found in charity shops. 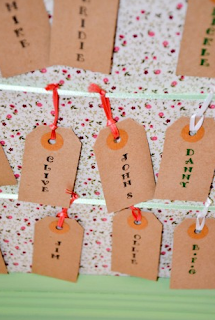 Our table plan was a large frame which we covered with material and then added ribbon and attached luggage tags where we printed each guest's name, and we had place names tied to the fudge favours made at our local sweet shop: Mr Chill's. Stationery: our wedding stationery was created especially for us by Alice at Alice Palace including invites, RSVPs, order of the day cards, bunting and table names. We are very fortunate that Alice is my sister and I work for the company, so it was wonderful creating our unique design with Alice, and actually being the customer for a change! 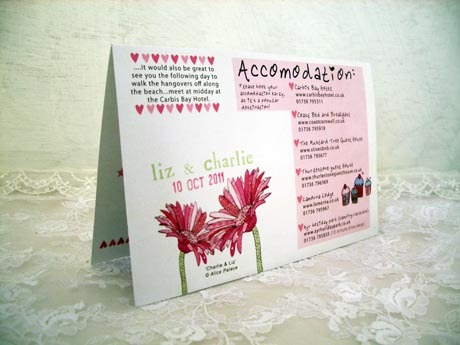 She created a perfect design which set the fun and relaxed theme for the day. 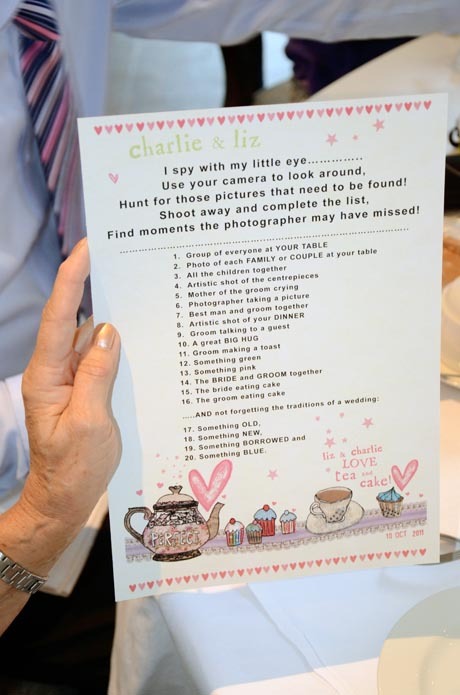 We also created an eye-spy list for the children and provided disposable cameras on the tables for them to use. Once the wedding breakfast was over we had speeches by the Groom and Best Man, followed by the first dance which was performed brilliantly by Gina and Scott of ‘Two's Company’, a duo band from Cornwall who we found on the internet. They were fantastic and performed two sets before we put on our ipod playlist (which we created from asking all of our guests to tell us two songs they would dance to) and ended the evening at about midnight. Everyone was up dancing and we had a truly magical day. 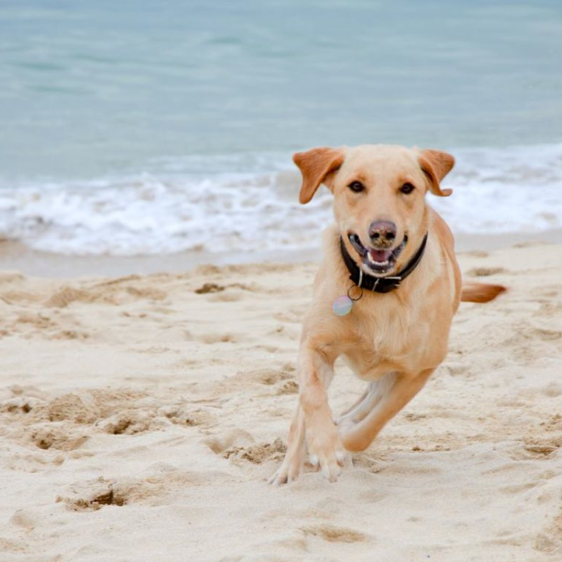 The honeymoon: a week in St Ives with our dog, Honey the labrador! Memorable Moments: Our vows – we loved every minute and both of us were so happy. 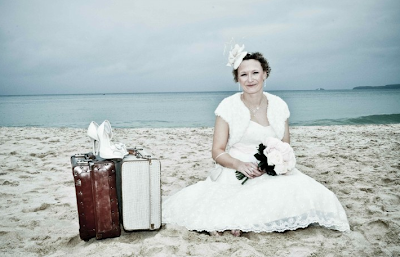 Being able to have our photos on the beach was brilliant too. Advice for other couples: enjoy every moment – it goes so quickly! And plan your wedding exactly as you both want it. We did just that and we wouldn’t have changed a thing! We also added a box of supplies in the ladies loos including plasters, hair spray, perfume, scissors etc., and our female guests loved that we had considerered their possible needs. Wow the pictures are really nice. I like it. Congratulation to charlie and liz. Thank you fro sharing their moment. Thank you for featuring my photography, I adore Liz and Charlie. 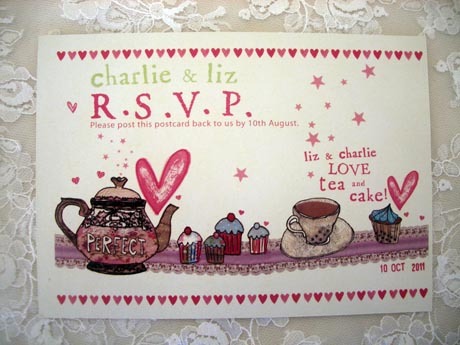 I was lucky enough to be a guest at Charlie and Liz's wedding and it was a truely wonderful day. Very hard to have a "unique" wedding but this was very unqiue and "very C & L". Wonderful, lovely, fun, relaxed, and beatiful!